This is a rather motley but interesting assemblage of music composed in the century recently passed – just barely so in the case of the Sibelius (1902) and the Debussy (1905). The Origin of Fire, written for the opening of the Finnish National Theater, is based on the Kalevala, and specifically on a Prometheus-like story from that Finnish epic poem. Louhi has stolen fire, but Ukko returns it to the people by striking his sword. Less this nine minutes long, this essentially is a brief narrative cantata for chorus and orchestra with baritone solo. Practical concerns have kept this work from being more familiar: obviously it is expensive and difficult to contract a chorus and a baritone for such a short work. In 1953, the Helsinki University Chorus was touring the United States, and Remington took advantage of their stop in Cincinnati to record this relatively minor but still first-rate bit of Sibelius – in stereo, no less. The singing is full of enthusiasm, and the Cincinnati musicians acquit themselves well. "Enthusiastic" also describes Pierre Dervaux's La Mer, recorded in Paris's Salle Wagram with the Orchestre des Concerts Colonne for Command Classics – now (like Remington) defunct. Dervaux's ocean is more Mediterranean than Atlantic. This is a warm reading that – forgive my saying so - one almost can bathe in! Even the last movement, which conductors such as Toscanini made menacing, is given a not unwelcome mellowness here. The Parisian orchestra plays with character, and Enoch Light's recording captures ambience and detail missing from many others. Fernando Previtali made several workmanlike operatic recordings in Italy for RCA Victor, but he also made purely orchestral recordings for other labels, such as the Feste Romane preserved here, and originally issued on Westminster. He conducts it passionately, and if the orchestra from the Academy of Santa Cecilia lacks the ultimate in precision and tonal splendor, the musicians play Respighi's score affectionately – particularly in "The October Festival," which is full of telling detail. I detected a faint wow – for example, during the chiming of the bells. Speaking of practical concerns, American composer George Antheil realized that his Ballet Mécanique would be more discussed than played as long as he retained its original scoring, which called for 16 player pianos! In 1953 he therefore revised it to replace the 16 player pianos with four live pianists, which is how Robert Craft recorded it circa 1957. Craft also had the brilliant idea of replacing the score's two airplane propellers (!) with the sounds of actual airplanes whooshing between the speakers. No doubt Erik Satie would have approved, and I hope Antheil would have as well. Originally issued on Urania, Craft's recording keeps the music's "bad boy" charm intact. 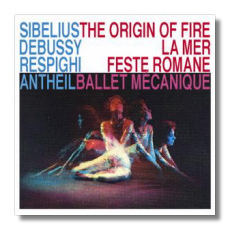 Reel tape masters were used for all of the recordings except the Sibelius. David Gideon's digital remastering will have you forgetting everything but the music and the musicianship. ReDiscovery's CD-Rs come with the most minimal of "booklet" notes – actually, there is no booklet at all, just a title card – but much care has been taken with the source material, and this is a first-class reissue in every way. This disc will set you back just $15, which includes shipping. It, and other ReDiscovery titles, may be ordered from www.rediscovery.us.